Computational Sciences and Robotics, M.S. Professors McGough and Weiss; Associate Professors Pyeatt, Qiao, and Riley; Assistant Professors Karlsson, Hinker, and Rebenitsch; Lecturer Schrader. 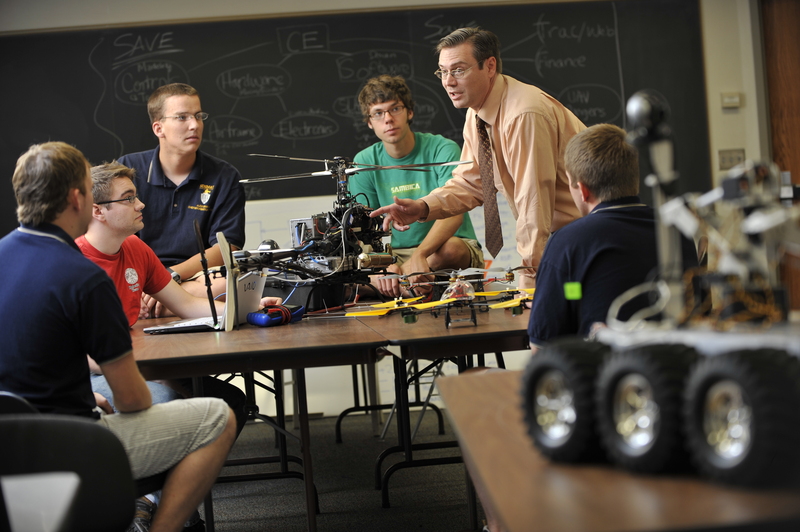 The Master of Science in Computational Sciences and Robotics (CSR) is a distinctive degree that combines the intelligent power of the computational sciences with the cutting edge utility present in modern day robotics. The CSR graduate program provides students with the advanced skills they will need in a rapidly evolving field. The program has the specialized courses to develop technical skills along with a strong emphasis on teamwork, including research projects which involve faculty and students from a variety of disciplines. The core of the program covers the fundamentals and the students have the opportunity to gain advanced knowledge in focus areas such as pattern recognition, machine intelligence, simulation, computer vision, nonlinear control, digital signal processing and communications. The primary objective of the CSR program is to give students a basic understanding of the tools required to implement intelligent systems in a dynamic context. Two options for the degree are offered: thesis and non-thesis. The thesis program provides a research experience which is more focused. The non-thesis option provides the opportunity for students to expand their technical background with additional course work. Graduates of this program should have a variety of career options in industrial applications, defense, homeland security, space exploration, or graduates can elect to continue their studies with a more advanced degree. The entering student will normally have completed a four year degree (B.S.) in either computer science, computer engineering, electrical engineering, mechanical engineering, or a closely related field of study. The admission committee also expects a minimum of 3.0 GPA or higher in the undergraduate program of study. However, any capable and highly motivated student interested in this program is encouraged to apply regardless of academic background. Credit by examination may be available for certain courses. In the case of deficits in background, the student may be admitted on a probationary status while they make up missing coursework. Two semesters of calculus-based physics are suggested but not required. Three semesters of programming including a semester of data structures. A minimum of 30 credits is required. A minimum of 6 credits of CSC 798 (Master’s Thesis) and 24 credit of course work is required. The twenty-four credits of course work is divided into core and elective courses. CSC 415/415L/515/515L Introduction to Robotics/Lab is required. A minimum of 18 credits of elective courses. A satisfactory thesis based on individual research. The student must present a formal defense of his or her thesis research. A minimum of 33 credits is required. The 33 credits of course work is divided into core and elective courses. A minimum of 24 credits of elective courses. There is no foreign language requirement for the M.S. degree in CSR. The CSR program is highly interdisciplinary and we have several successful students from outside disciplines with Mechanical Engineering, Computer Engineering, and Chemical Engineering being a few recent examples. The CSR program also allows for courses from a variety of disciplines to be included in the program of study. Please contact the program director for details on allowed electives within the CSR program. The CSR program has established agreements with the B.S. in Computer Science and the B.S. in Applied and Computational Mathematics to allow for students to complete both the B.S. program and the M.S. program in five years. Students interested in this program need to apply to the CSR program before or during their junior year. Students accepted into the program can apply up to ten credits of graduate courses towards their undergraduate degree and these same courses will apply to their graduate program of study. Students should inquire about this program at the department office or contact the CSR program coordinator. Currently active research areas include: Autonomy, Computer Vision, Controls, Localization, Mapping, Motion Planning, Security, High Performance Computing, Parallel Computing, and Navigation. Some of the active research projects include: Unmanned Aerial Vehicle, Unmanned Ground Vehicle, 3D Printing, and Intelligent Controls.